There are so many distraction in my world that the task of writing to our Bridge of Hope children never get to be crossed out on my to-do-list. 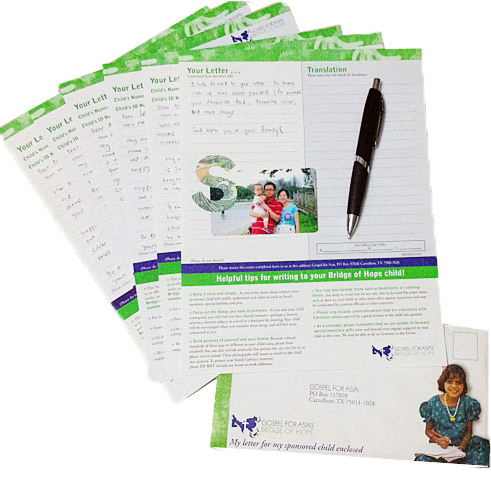 Writing letters to our sponsored children has been a pending task for a couple of months and we finally took action and wrote letters to our children. As we penned down our thoughts to the children on paper, it brought back memories of my schooling years when I was writing to my overseas pen-pals when Internet was then non-existent. It dawned on me that sponsoring children also means connecting and praying for them. It is like extending our family to include them into our lives. In a culture where these children are constantly derided and told worthless, may our letters lift up their spirit when they know that someone in another part of the world still cares, thinks and prays for them. Through our sponsorship, the children learn about the Bible, Jesus’ love, receive education, daily meal and medical care. 100 percent of our child sponsorship donations goes directly to the Bridge of Hope programs on the field without deducting anything for administrative costs. Would you extend your hearts and hands to these little children? To find out more about Bridge of Hope, click here.